Use heavy-load ×8-drive special chassis. Adopt hydraulic power steering. 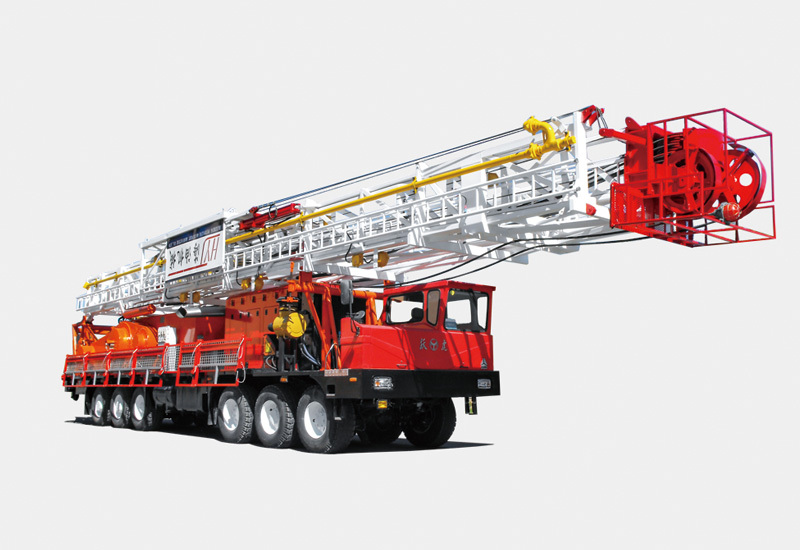 The workover rig has high trafficability and high cross-country performance. The emission meets China 5 standard. It is environmental friendly. The main brake can adopt band brake or hydraulic disk brake. The auxiliary brake adopts pneumatic water-cooling disk brake or pneumatic tong brake. The table drive box has forward and reverse gears so as to adapt to various operations of drill pipe and rotation. The torque release gear can guarantee safe release of deformation of the drill pipe. The derrick has front open and is a binodal suit FC mast-type derrick. It raises, stretches out and draws back by hydraulic pressure. Racking platform has many structure types. The components can open automatically. No overhead installation needed. Excellent solid control, well control, high-pressure manifold system, pump sets, drilling and workover tools, duty room, camping house and other facilities which can meet different users’ requirements.